How much should a single taco cost? We're going to say $3. Hecho is a Mexican restaurant in the quickly gentrifying part of the Castro -namely near a Whole Foods - so naturally the team decided to go balls deep on charging prices that are cool with single bro engineers but not so cool with us, or people who appreciate the beauty of places like Taqueria Cancun and El Castillito. Two tacos are $12. Digest that, and continue reading. If these tacos tasted incredible, and involved foie gras, scallops, or gold flakes, we could get down. But mostly the tacos are just ok, and the weak tortilla game really gets us down. For other dishes, portions are decidedly non-sharable for more than two people, and hungry humans such as ourselves can demolish the good, but not free, chips and limey guacamole in 8-10 bites. The more we thought about it, Hecho has essentially taken Chevy’s Fresh Mex's menu, added a few ingredients, raised the prices, and hired a hell of a lot more attractive, if slightly less competent, staff, and figured out how to mix awesome cocktails that don't involve one of those whirly frozen drink makers. Oh, and they sprung on a good interior designer. 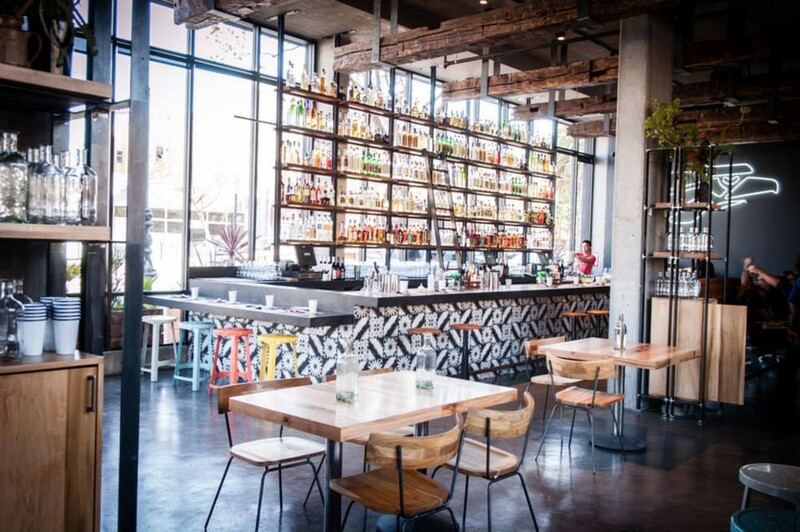 Besides the food, Hecho does have a fun energy and the bar is spacious enough to get a crew together for margaritas and not be constantly elbowing people in the ribcage. There's also a tall bar against the window that involves a ladder. The sliding kind like in Beauty & the Beast - to which I tie back most of my cultural references - so points for that. But no points for tacos that cost $6 a piece. We're going to have to start some sort of advocacy group for free chips and salsa at Mexican places. What is the deal, people? Since this isn't a thing, we tend to always have to order the guac, and at Hecho, they know what they're doing with mashed avocados. They also have found a tiny, tiny bowl to serve it in. I guess they're quality over quantity advocates. Taro chips are a fun way to eat this. Unfortunately, the dish is mostly pickled onions and cucumber and the grapefruit is the best part. Not how things should be. Superb green goddess dressing, and adding steak is the pro move if you want to make a meal of it. Served up on a sizzling hot plate, the fajitas are basic and a safe move if you are an un-adventurous Mexican food consumer. And also, pretty much the same as you'd get at Chevy’s Fresh Mex (RIP). The duck mole is too dry, the carnitas are too bland, but the fried fish tacos are just right. The spicy cabbage slaw is awesome. If short ribs are anywhere in the vicinity, we are probably close by as well. Haven’t had them in a quesadilla before and it is bomb. Meat + sauce heaven. Surprisingly good, with a delicious spicy tomato bean sauce. We were impressed. The plates at this new tapas bar are hit or miss. But Beso has serious potential. If they'd just dim the lights. Ignore Tacorgasmico's terrible name, and enjoy the affordable and delicious Mexican food. Comal serves Mexican food worth traveling to Berkeley for. Upscale Mexican for date night and pretty much any other night. Who cares what the statisticians say? La Taqueria does not serve the best burrito in America. It doesn’t even serve the best burrito in SF.